The total collection of Vijay Devarakonda's Geetha Govindam has breaching $2 million mark at the US box office in 11 days. It has become the fifth film to achieve this feat in 2018. Vijay Devarakonda's Geetha Govindam has continued to keep the cash registers ringing at the US box office with its total collection breaching $2 million mark in the country in 11 days. Having opened to a fantastic response, Geetha Govindam took the US box office by a storm and collected $1,807,912 in the nine-day extended first week. The movie went on to become the highest grossing film for Vijay Devarakonda and beat the records of Arjun Reddy, which collected $1,778,000 in the country in its lifetime. The film also become 13th all-time highest grossing Telugu film in the country. In its second week, Geetha Govindam is clashing with Neevevaro, Lakshmi, Aatagallu and other new releases. Trade experts predicted that the new movies might take a toll on its collection. As predicted, the movie did witness drop on its second Friday, but its business was much bigger than the new releases. Geetha Govindam collected $63,082 at the US box office on its 10th day, taking its total to $1,870,994. Idlebrain Jeevi‏ tweeted, "USA daily grosses of Telugu films on Friday (24 August): #GeethaGovindham - $63,082 (126 loc) - total: $1,870,994 #Neevevaro - $16,154 (76 loc) - total: $30,151 #Lakshmi - $1,773 (26 loc) - total: $1,773 #Aatagallu - $781 (16 loc) - total: $2,030 [sic]"
Idlebrain Jeevi tweeted, "#GeethaGovindam collects $151,967 on 2nd Saturday and joins $2 Million club in USA! Total gross so far is $2,023,173. Only 11 straight Telugu films are part of this elite club. 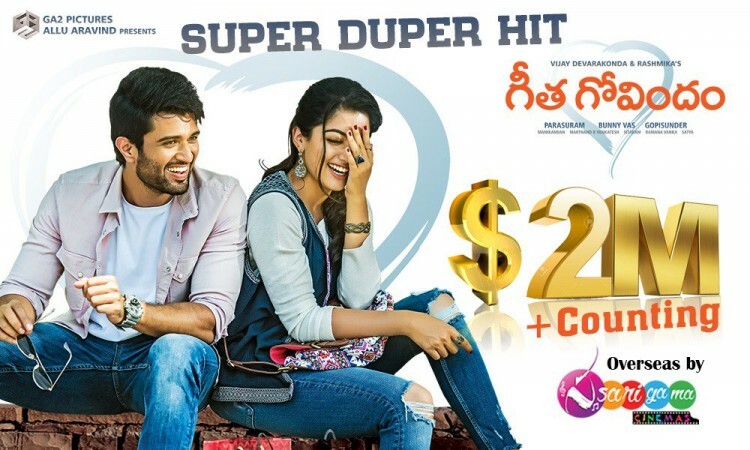 #GeethaGovindam is 5th Telugu film to join $2M club this year! Outstanding! Geetha Govindam has become the 5th film to achieve this feat in 2018 and 12th film in all-time highest Tollywood movies. Here is the list of top 20 highest-grossing Telugu movies of all time in the US. The numbers are based on different sources and they may vary from the actual numbers released by its distributors or makers. All the figures are in dollar and million.